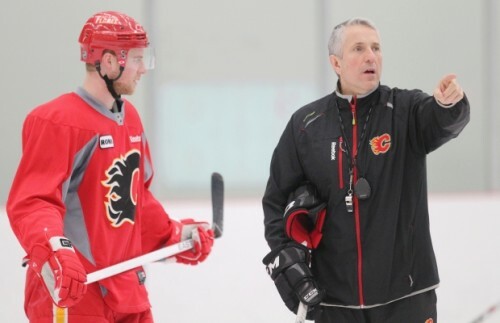 Coming in to the 2014-15 season, not much was expected from the Calgary Flames. This was supposed to be year two of a complete roster overhaul, and most expected them to finish in one of the bottom two spots of the Pacific Division. Jiri Hudler, Mark Giordano and the rest of the Flames had other plans. This isn’t a tale of a team catching fire (sorry, I couldn’t resist) at the right time. The Flames have been in second or third place in their division for most of the season, and the guy that should be thanked for that is Head Coach Bob Hartley. When you look at the Calgary roster, there aren’t many big names that jump out at you. There’s definitely some strong young talent (ie Johnny Gaudreau, who is very much in the mix to win the Calder Trophy) that gets you excited, but there was no reason to think they’d be in playoff contention, considering they share a division with the Ducks, Kings, Sharks and Canucks. Anaheim has run away with the division, the Canucks have been consistently above average, the Sharks have grossly underachieved, and the Kings appear to be playing possum with the Western Conference. All of those factors put together have left the door open for Calgary to make the playoffs. Coaching a team full of young talent isn’t easy. They’re adapting to a faster game than they’re used to, there’s bigger expectations, and there’s more responsibilities. When a coach is put in charge of a roster of that ilk, no owner or GM in their right mind is expecting their season to last past mid-April. Sure, that would be nice, but it’s more about growing the game of the younger players to build towards being a consistent playoff team in the coming seasons. After only one season in Calgary (where the most notable story of his first season was being challenged to an intermission fight by former Canucks coach John Tortorella), Hartley has accelerated the development of guys like Sean Monahan, Josh Jooris, and TJ Brodie. Defenseman Dennis Wideman has had a great bounce-back season, and he’s gotten more than most would have expected out of a Karri Ramo/Jonas Hiller goalie duo. Calgary definitely had the look of one of those teams we’ve all seen in many sports throughout the seasons. An unexpected team comes out of nowhere, has a strong start to the season, plateaus, then the market correction happens and they finish close to where the pre-season prognosticators had predicted. The Flames seemed to fit that bill, yet they refuse to come back down to earth. Even when there’s been reasons for that to happen (losing Defenseman/Captain Mark Giordano for the remainder of the season), the Flames have soldiered on. The start strong/finish weak narrative appears to becoming a reality for the Nashville Predators (Peter Laviolette’s could be a Jack Adams nominee, and was a border-line lock for it before they Predators current 2-8-1 tailspin), but Calgary continues to bring a lunch-pail effort each and every night. If you don’t want to take my word for it, read what Blues head coach Ken Hitchcock has to say about a recent match-up against Hartley’s bunch. There’s still twelve games left in this season (entering Thursday night’s tilt against Philadelphia), and seven of those games are against teams that likely aren’t heading to the postseason. Everything is lining up for the Flames to make the Stanley Cup Playoffs for the first time since 2008-09. But even if they do miss the playoffs, Bob Hartley is the best candidate to receive the Jack Adams in Las Vegas on June 24th.